The XC9536 is a high-performance CPLD providing advanced in-system programming and test capabilities for general purpose Logic integration. It is comprised of eight 36V18 Function Blocks, providing 800 usable Gates with propagation delays of 5 ns. See Figure 2 for the architecture overview. Power Management Power dissipation CAN be reduced in the XC9536 by config- uring macrocells to standard or low-power modes of opera- tion. Unused macrocells are turned off to minimize power dissipation. 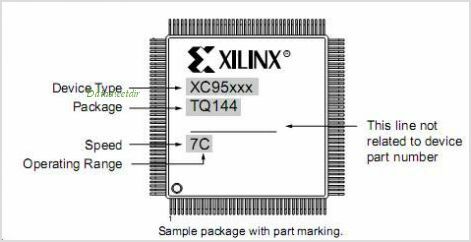 By Xilinx Corp. This is one package pinout of XC9536,If you need more pinouts please download XC9536's pdf datasheet. XC9536 circuits will be updated soon..., now you can download the pdf datasheet to check the circuits!